Elan Corp. (ELN)'s share price popped over 20 percent earlier today, but by the afternoon was up "only" over 13 percent. Still, not bad at all considering markets are down about 2 percent. The Irish drugmaker and Johnson & Johnson (JNJ) announced today they have signed a deal giving J&J control of most of Elan's Alzheimer's research. In addition, J&J will invest $1 billion in new Elan equity in exchange for an 18.4 percent stake. Elan's Alzheimer's 50/50 joint venture with Wyeth (WYE) -- the Immunotherapy Program, or AIP Program -- is for research, development and commercialization of selective products for treating and preventing neurodegenerative conditions. It includes multiple compounds that are being evaluated for slowing the progression of Alzheimer's disease. J&J will assume Elan's responsibilities in the venture, but Elan will remain with 49.9 percent of the newly formed company. (Wyeth is itself being acquired by Pfizer Inc. (PFE). J&J will initially inject another $500 million to cover development costs. One of the compounds in the program, bapineuzumab, is in late-stage development and has been closely watched. Now J&J will have an interest in it and intends to push the bapineuzumab development and launch. As many as 5.3 million in the U.S. live with the disease. "Alzheimer's disease is a significant unmet need in aging populations globally," said Sheri McCoy , J&J's worldwide chairman of Pharmaceuticals, in a statement. J&J could "accelerate the AIP Program development, and increase its potential availability for patients globally." Husseini Manji , a head of Neuroscience in J&J's Pharmaceutical Research & Development, added: "This transaction will be a key component in achieving our vision to develop treatments that target underlying disease biology." Elan said the deal will help it reduce its net debt by 70 percent to $400 million, help cut costs by $100 million annually, and enable it to make a pretax profit by the end of next year. Elan Investors reacted favorably, but JNJ shares aren't doing so well in response to the deal, down about 1.7 percent. While the deal gives J&J access to an area where it had almost no presence, earlier trials of bapineuzumab had mixed results, so it is regarded as a high-risk investment. 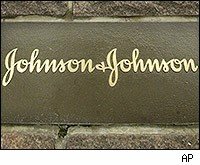 Not only that, but the deal will have an estimated dilutive impact of $0.02 to $0.03 on Johnson & Johnson's 2009 adjusted earnings per share.